In today’s technology-driven world, there are many ways to communicate with employees and clients. Email, instant message and VOIP (Voice Over Internet Protocol) are a few of the more common ways. However, many companies are embracing a new, innovative, and dynamic method of communication to enhance their businesses: streaming video. Traditionally, in order to be watched, videos on the internet must be downloaded. When a video is downloaded, the file is saved to the computer to be viewed at the user’s convenience. If the video file is small then the process is relatively simple, but if the video file is large, downloading it can waste both time and hard drive space. A more user-friendly method is to embed the video on the webpage using HTML code; this method is called HTTP streaming or HTTP delivery. Popular video sites like YouTube and Dailymotion use this method. With streaming video, the user actually watches the video as it’s downloading onto the computer. In other words, the video is broadcasted live over the Internet, in much the same way content is shown on television. Streaming video can be used to broadcast live events, sometimes referred to as webcasts, as well as prerecorded events, giving the viewer instant access to content. There are a few resources needed to effectively stream video. The content distributer needs a specialized server, a camera, a digital encoder, a video publisher, and a content delivery network. The event is filmed and the footage is sent to a digital encoder to digitize the film, then a video publisher, and then distributed to the content delivery network via the Internet by providing a URL for the end users to view live. To watch the stream, the viewer must have a player, which decompresses the video data and makes it viewable, as well as an internet connection. The player can be either a downloaded piece of software or part of the browser. Video can be streamed in many file formats, some of which include Windows Media, QuickTime, MPEG-4, and Adobe Flash. Each format has its own advantages, as well as drawbacks. For example, Real Media images are generally considered lower-quality than MPEG-4 and other formats, Windows Media, a Microsoft product, can encounter problemson platforms other than Windows/Internet Explorer. The ultimate choice is up to personal preference. The major advantage of using streaming video is that there is no waiting involved, as the user watches the video while it’s downloading. Also, streaming video is a great way to broadcast live events as they happen. Major television networks make use of streaming video for things ranging from sporting events to coverage of news and weather. Streaming video has many useful applications in the business world. 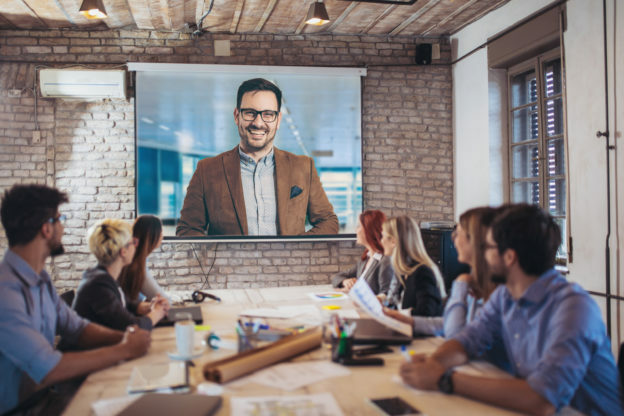 For example, if a business has multiple offices, streaming video can be used for weekly meetings or seminars, and even for employee training sessions. It also provides a quick and exciting way to bring information to potential clients. If integrated properly, streaming video can drastically improve inter-company communications, as well as how communication is used with both clients and other businesses.